This paining started in the spring of 2017 as a plein air. I found this old tree stump full of character and had to paint it. Just recently, I went back and added life to it. Good art is about telling a story but also leaving room to the imagination. 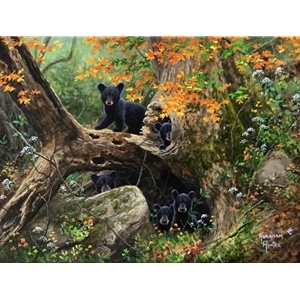 These five little bears are playing together in the old stump. They've heard you coming, and now you've distracted them from playing hide and seek. Since it's rare for a mother bear to have five cubs, I like to think these cubs are in the middle of recess from the school of nature.